For me, “landscape” is a peaceful concept, thus much of the line I use is rolling, undulating line, the restful curve, the mildly exhilarating swoop. 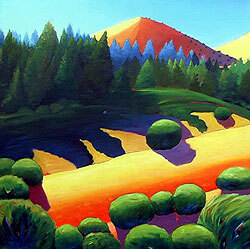 After all, I was born among (and lived most of my life among) the rolling hills of Northern California. Being a third generation Northern Californian, the area’s landscape speaks powerfully to me, and I hope, through me. My landscapes may start with a generally realistic sketch, but once work in the studio begins, painting takes precedent over scene, emotional response over strictly visual response. My paintings are more about something than they are of it. The push of color to extremes, and the use of line to imply motion help me show what I feel about a scene or abstract idea. I tend to lean toward warm colors (lots of ochre, yellows, oranges), colors inspired by a lifetime of seeing California summer grasses. While these warm colors are restful to me, by increasing the intensity of hue and through the juxtapositioning of complements, I use color to add vigor in my paintings. I want the land to be alive. I want the butterfly to fly, not to be pinned to a board. As Imagination is such a vital part of my work, I rarely paint on site any more. Most paintings begin with an image on the computer monitor of a digital photo that I have taken. After several small pencil sketches to arrive at a composition, I begin sketching with charcoal sticks on a canvas, toned usually with Venetian Red or burnt sienna. I repeatedly rub out entire sketches or parts of them until pleased with the flow of lines. The sketch has to sit then for several days and pass casual inspections or get rubbed out. Once the actual painting starts, so much freedom is allowed that I am never completely sure what the final product will be. At the end of a session, I usually feel both tired and exhilarated. I am usually delighted with what I have done. As days pass, I find things that disturb me, and the second phase of painting starts, revision. This may go on for some time, as the piece sits or hangs where I can glance at it from time to time while I work on other paintings. I usually start three or four oils at the same time. It is not unusual for a painting to get new paint months after its start. At the end, hopefully, I share with the viewer some of what California is to me.